With the growth and moderization of Sicamous the time for sewer hook ups has arrived. We at Albatros Plumbing Heating & Gas Fitting Ltd. are doing our best not to disturb any more of your yards landscaping then is absolutely necessary. We offer a free consultation and quote to discuss the best solution to connect your home to the new sewer whether it's digging around the outside of your home or maybe turning drains in your crawlspace or basement. 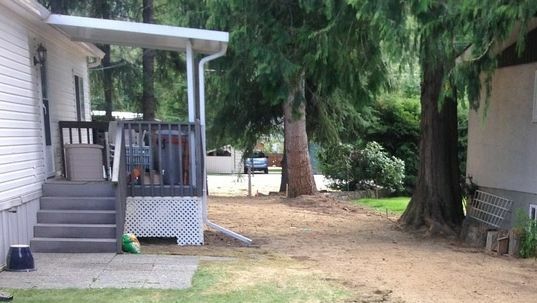 Throughout the years we have tried different methods of installing sewers and putting customers yards back together and have found this to be the best. It is also mandatory to install a new or upgrade your existing water meter to comply with the District of Sicamous Cross Connection Control Standards by installing a PRESSURE REDUCING VALVE (only required in certain areas), a DUAL CHECK VALVE, and a means to control thermal expansion by either a THERMAL EXPANSION TANK or a THERMAL RELIEF VALVE. We strongly suggest the thermal expansion tank as you are now paying for every drop of water going through the meter so why send it down a drain without using it. We also need to add a second shut off valve and run a small wire and install a remote meter reader on the front side of your home facing the road. When we arrive at your home we start by laying out where the new sewer will go (which we discussed with you at the time of your quote). 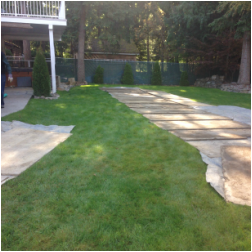 After that we lay out tarps and plywood next to where we will be excavating to protect the rest of your landscaping from any damage. We also locate and expose your septic tank to have it pumped out and filled with gravel. Then we start digging usually starting by the house to locate the existing sewer so we can confirm there is enough grade between there and the inspection chamber at your property line (the red cap in your yard). 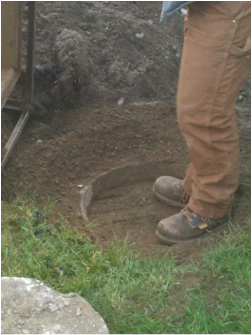 If all is well we continue excavating and installing your new sewer with a clean out installed just outside your home. Additional cleanouts would be installed at the proper locations to meet plumbing code such as sewer is longer then 50' or a change of direction greater then 45%. When the new sewer is connected from your home to the inspection chamber we make sure the entire sewer is properly bedded and sloped in the right direction. Typically we try to achieve a slope of 2% or 1/4" per foot however a 4" sewer is allowed to have as little as 1% or 1/8" per foot slope. 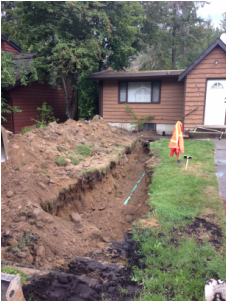 Once your new sewer is in, we need to fill it with water and wait for our District of Sicamous inspector to show up. The inspector will inspect both the new sewer outside as well as any plumbing changes that may have been done inside (such as turning sewer pipes in your crawl space or basement). The inspector will also inspect and tie off your water meter and take a water meter reading as your new sewer bill is a part of your water bill. Once the inspector is satisfied that everything is installed to the plumbing code he will allow us to back fill our excavation. At that time the inspector will pull the plug in the inspection chamber at which time you will be on sewer. The last thing to do is pump out and fill your existing septic tank with gravel and call for one more inspection. 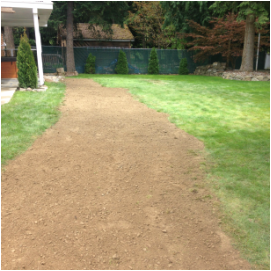 As we backfill our trench we clean up our plywood and tarps and rake the excavated area making it ready for top soil and grass seed, gravel or any other type of covering you would like to do.